If you've purchased a pressure washer, nothing protects your investment better than pressure washer filters. Over time, contaminants in the water can cause damage to your pump, nozzle, or heater. These filters are an easy and effective way to minimize that damage and significantly extend the operating life of your equipment. Easy to install and maintain, most of these filters feature cleanable metal screens that never need to be replaced. Protect your pressure washer. Use a filter. Attached directly to the pressure pump. 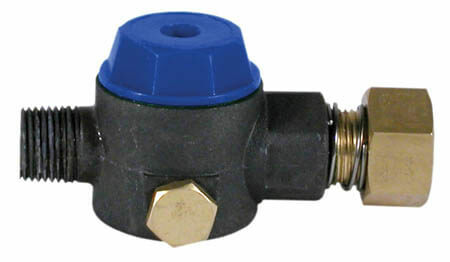 Receives standard 3/4" garden hose attachment. Protects the pump from contaminants in the water. Cap easily unscrews with an Allen Key to clean out screen. Protects the pump from contaminants in the water. Cap easily unscrews with a spanner wrench to change filter. 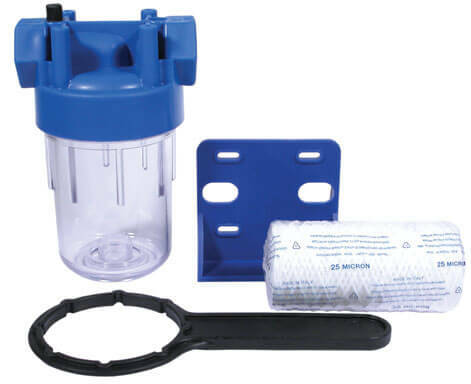 SP5-25 Dimensions: 5" x 2.5"
Read more on water filtration systems. 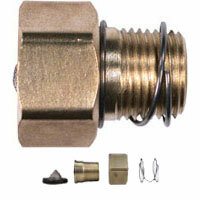 Protect your turbo nozzle from damage caused by debris in the water flow. Accumulators are designed to extend the life of your pressure washer pump by reducing the pulsations that arise in the incoming water supply. The nitrogen filled accumulators absorb the "shock" of low pressure instead of your pumps pistons, valves and packing. 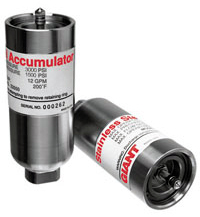 It is recommended that the accumulator be mounted pointing down as a safety precuation. This procedure allows the accumulator to remain cooler during system operation and prolongs the effective operating life of the accumulator bladder. Shelf life of the nitrogen pre-charge of accumulator is approximately six months before re-charging is necessary. It is recommended the nitrogen pre-charge be checked approximately every three months after installation in a pressure system.